The icy steppes of Russia, the opulence of a Romanov Tsarina, a mix of hauteur and passion, brocades and fur, sweeping dresses and fabulous jewels…. Those images are the source of inspiration for Tsarina, the new fragrance from the London luxury perfume house, Ormonde Jayne. It is one of four fragrances in the new Four Corners of the Earth collection which was released in late 2012 and which pays homage to the different parts of the world that have inspired Ormonde Jayne’s founder, Linda Pilkington. The collection is the result of collaboration between Ms. Pilkington and the perfumer, Geza Schoen, and consists of four fragrances: Tsarina, Qi, Montabaco and Nawab of Oudh. I have samples of all four fragrances, provided courtesy of Ormonde Jayne, and will review each one in turn, starting now with Tsarina. Tsarina captures opulence and passion. It demands fur, leather, brocade, heavy silks in sweeping dresses and fabulous jewels to go with her haughty heritage. To call it a floral oriental is to misunderstand its rich complexity, it is more baroque. The perfume is profound, blending leather notes, rich Madagascan vanilla, amber and orris butter.’ This is a powerhouse perfume, ravishing and regal, distinctive and synonymous with the glamorous world of luxe. top: mandarine, bergamot, coriander, cassis. heart: hedione, freesia, jasmine sambac, iris, suede. base: sandalwood, cedar, vanilla bean base, labdanum, musk. Empress Alexandra Romanov, née Alix of Hesse. 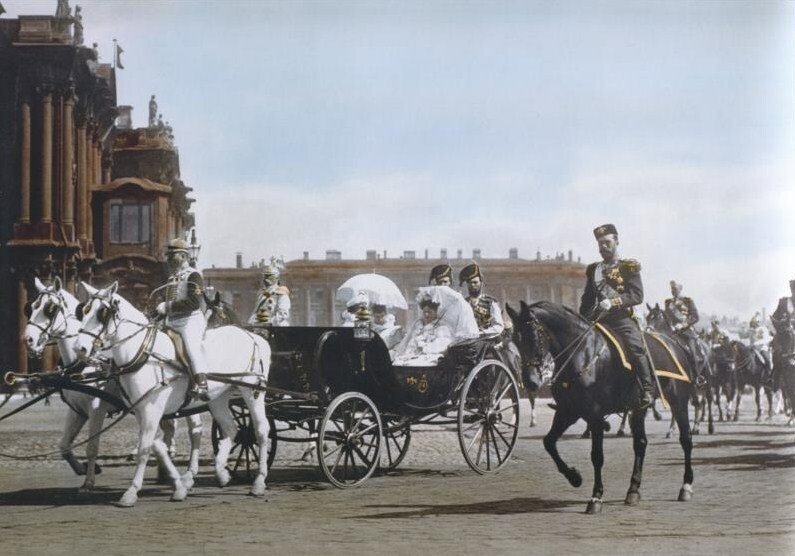 The description of Tsarina, along my past historical writings on both royalty and the Russian Imperial Family, led me to anticipate either Catherine the Great or Alexandra Romanov, last Tsarina of that ill-fated family. I expected images of snowy St. Petersburg, furs, jeweled chains of opulence, and a heady, baroque oriental that epitomized hedonistic splendour and excess. 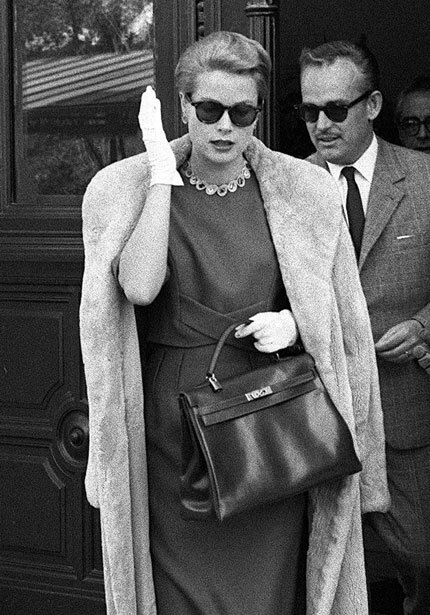 Instead, I found an incredibly elegant, soft iris and suede scent that — to my mind — consistently evoked the cool, restrained, pale beauty (and occasional hauteur) of Princess Grace. Tsarina is, at times, as fizzily fresh and crisp as the best champagne (if there were ever a citrus, lemon champagne), at other times icily cool, but always romantic with a plushly soft heart like the finest suede coat matched with dove-grey gloves. Tsarina opened on my skin with the freshest burst of citrus imaginable. It was so zesty, it felt as though you’d just cut into a lemon and been squirted by its juices. Light and bright, it mixes with the sweet, airy scent of freesia, some subtle musk, and an underlying note of soft, white woods. There was also a very faintly soapy element that creeps around the edges, mixing with the citrus accord, to add to the impression of a very fresh, Spring-like scent. The woody note is subtle, but even more subtle was the orange tonality which flickered for a brief moment before vanishing entirely. I tested out Tsarina three times, and mandarin never appeared for me at all during the other two tests. Everything feels green, fizzy and bright, thanks, in part, to the hedione which seems to be a very significant molecule in 20th century perfumery. (You can read Bois de Jasmin‘s discussion of its uses in everything from highlighting jasmine to its role in Eau Sauvage, Diorella, and Van Cleef & Arpel’s First.) The Perfume Shrine explains that hedione is an aromachemical that is often used as a substitute for jasmine absolute, “but also for the sake of its own fresh-citrusy and green tonality.” It is said to “give fizz to citrus notes much ‘like champagne’.” Here, with Tsarina, it does just that, lending a sparkling quality to the bergamot lemon, while also adding its own green touch. Less than ten minutes into the opening of the Tsarina, the perfume’s strong backbone of suede raises its head. Soft, buttery, white-dove grey is the colour that comes to mind, tinged with delicate iris, and the whole thing set against a backdrop of lemon. As time passes, the citrus note fades and the iris suede takes over completely. It smells exactly like the soft, light interior to a very expensive purse. There are growing peppery smoke notes from the cedarwood, combined with the light musk and those airy, pastel freesia blossoms. The merest hint of soap weaves its way around all those notes, joining another subtle thread in Tsarina’s tapestry: powder. Iris often has a very powdery characteristic, but it’s very light here. Instead, the much plusher orris butter creates a velvety soft image, accentuating the grey suede note. It’s very cool in tone; never quite icy but never effusively warm, either. It has a regal hauteur and quiet aloofness, if you will. The perfume is surprisingly soft and lightweight in texture, though strong in its initial moments. However, after less than forty minutes, the sillage drops dramatically. It’s as gauzy and light as the softest pashmina scarf, resting just lightly on your skin with a grey-pastel touch of iris, suede, heaps of freesia and a touch of vanilla. The wood and smoke notes flicker here and there, popping around like ghosts. Often, in other treatments, cedarwood can seem excessively peppery and smoking, verging sometimes on the mentholated. Here, however, the impression is of soft cashmere woods with something a bit unexpected. On two of my three tests of Tsarina, I picked up something that definitely smelled of anise. It’s as though the often mentholated aspect of cedar has been tamed or quietened to such a degree that there is just the merest hint of its chilly, smoky, licorice-y character, now diluted down to a faint soupçon of mere anise. It’s in perfect keeping with the restrained, elegant aspect of the perfume. Three hours in, the base notes of Tsarina start to emerge. There are quiet elements of sandalwood, vanilla, and sweet notes from the jasmine, but the real end of Tsarina is labdanum. It is a rich, nutty, slighty leathery, minutely dirty and animalic resin that is one of my absolute favorite notes. Here, it’s light and sheer, far from opaquely thick or molten. The labdanum is subtly tinged by the other notes at times but, for the most part, Tsarina’s dry-down consists primarily of the ambery resin, some powder, and little else. It’s pretty but, for my tastes, too light, sheer and simple. All in all, Tsarina lasted just under 6 hours during my first test and a bit under 5 hours on the subsequent tests when I applied a lesser quantity. I have perfume-consuming skin, but I was nonetheless surprised at the moderate-to-short longevity for an eau de parfum concentration. (My beloved Tolu which is also an Ormonde Jayne eau de parfum lasted 7 hours when I reviewed it and just over 8 hours on a recent wearing.) The softness of Tsarina and its delicate notes are, perhaps, one explanation. The sillage began by being relatively good for the first 20 minutes, then dropped down to moderate-to-low thereafter. It became extremely close to the skin by the second hour; by the fourth, I thought the scent had vanished completely but faint traces lingered on, here or there, for another one to two hours (depending on test run). Everything about it is evocative of the opulent jewellery, furs and textiles that the description mentions and the Russians are famous for. It opens diffusive and bitter, hinting at the animalics to come but what’s really noticeable is a warm plushness, tinged by a darkness that comes from a combination of the powder of iris and indole of jasmine. The whole thing is, dare I say, rather Guerlainesque with its bergamot, sweet floral powder and balsamic funk. Tsarina is like Shalimar Parfum Initial but on a bigger budget (we’re talking a Tsars budget here people), cutting straight through the fruit and heading straight for the rooty iris and gorgeous, filthy base of proper Shalimar. It doesn’t mess around, to put it frankly. Tsarina is an incredibly feline fragrance, like a beautifully sleek black cat come in from the cold, slinking and weaving itself between your legs. Like a cat it is incredibly precious but not afraid to use its claws to assert it’s authority. There’s glamour here of course, but there’s also a steely strength just beneath the surface that says; “I may be incredibly beautiful but I’m even more dangerous”. I didn’t get any of that, I’m afraid. My experience evoked not just Grace Kelly, but the softness of an Impressionist painting of winter. Something by Claude Monet, in fact. All in all, I thought Tsarina was pretty and I liked it, though I expected to truly love it. Had I smelled the mandarin orange and leather — and had the labdanum been heavily resinous and opaque, thereby evoking furs, leather and baroque richness — I probably would have. Instead, Tsarina was predominantly velvety soft iris and suede on my skin. All three times I tried it! I should note that iris is not one of the notes which drives me wild with passion. In fact, it can be a note I struggle with, depending on what accompanies it. That said, I think this is one of the best treatments of iris that I have encountered in a while. In addition to my iris issues, however, Tsarina was also far too soft, gauzy and sheer for my personal tastes — both in terms of weight and in sillage. The longevity was also a problem, though the speed with which my skin can consume perfume is not the norm. I’m afraid my heart still belongs to Tolu, though I have to admit that there is something about Tsarina’s plush, velvety softness that is quite alluring. Its cool elegance is comfortable and easy, like the best pashmina cashmere scarf or the richest suede caressing your skin. I know a number of my regular readers are complete fiends for soft, harmonious iris scents and, to them, I say, I think this will knock your socks off! Unfortunately, Tsarina is not the easiest thing to get your hands on right now. It is not even listed yet on the company’s website (though it probably will be soon), and doesn’t seem available at other European retailers. As always, Ormonde Jayne fragrances are not sold in the U.S. At the moment, Tsarina is available at Ormonde Jayne’s two boutiques in London and is also available online at Harrods. That seems to be about it. Even worse, none of the perfume sample sites in the US currently offer any of the Four Corners of the Earth collection. So, you can’t even get the chance to sniff it! (When places like Surrender to Chance start selling samples of the collection, I will update this post accordingly.) Given the price, this is not something I would recommend buying blindly and unsniffed unless you know you love soft iris scents. The perfume comes only in one size — a large 100 ml/ 3.4 oz bottle — and costs £280.00. At the current exchange rate, that comes to approximately $422! I think cost is all relative and subjective. It depends on the person and how much they adore something. So, for those who love harmonious, elegant. quietly restrained scents, especially of iris and suede, Tsarina is definitely one to try out. 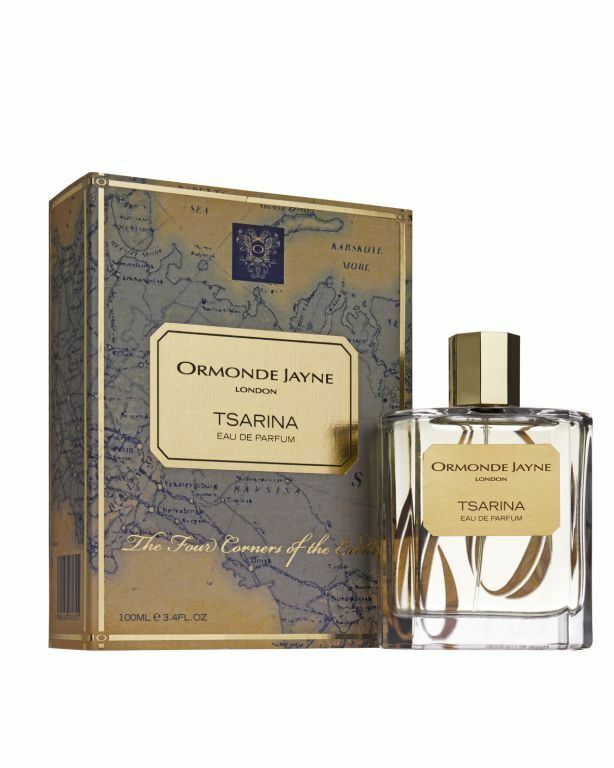 Disclosure: My sample of Tsarina was provided courtesy of Ormonde Jayne. However, that did not impact this review. My primary commitment is, and always will be, to be as honest as possible for my readers. Price & Availability: As noted, above, Tsarina is an Eau de Parfum which comes only in a large 100 ml/3.4 oz size and which costs £280.00. Although Tsarina and the Four Corner Collection are not presently up on the Ormonde Jayne website, you can find the entire line at Harrods which ships out internationally. Ormonde Jayne’s two London boutiques are at Old Bond Street and Sloane Square with the precise addresses listed on the website here. When US perfume sample sites, like Surrender to Chance, start to offer Tsarina, I will update this post with the appropriate link. This entry was posted in All Other Perfume Houses, Florals, Orientals, Ormonde Jayne, Perfume Review and tagged Four Corners of the Earth perfume collection, Ormonde Jayne, Ormonde Jayne Tsarina, perfume review, Tsarina, Tsarina perfume review by Kafkaesque. Bookmark the permalink. I have yet to try an OJ fragrance…have heard nothing but rave reviews about this line! One of these days I will buy a sampler as I am so far off the beaten path that there is no perfume shoppe in sight in which I could sample niche/artisanal lines (even Sephora is a 45 minute drive!). Although there is the fear that I might fall in love…and I don’t have $422 to burn! PS What happened to your Thomas Hardy quote? As a young adult he was by far my absolute favorite author. Nowadays I go for more lighthearted/spiritually enhancing reads. Thank you so much for stopping by, Brie! I adore the Ormonde Jayne scents that I’ve tried thus far, though this one was far from my personal style. Tolu, however, almost made me moan out loud. Unbelievable. Ormonde Woman was enchanting, rich, complex, unique and wonderful too! She infuses each one with such incredible, unbelievably luxuriousness that it really calls back to classic perfumery. Thankfully, both of those are considerably less than this new line. The $422… Ouch! My Hardy quote went by the wayside, I’m afraid. It was always meant to be a sub-title on the front page but, instead, it kept showing up on all Google searches. People have a complicated time as it is figuring out the blog’s name (I keep seeing “A Kafkesque Life”), which just makes me rue the day that WordPress wouldn’t let me use just plain “Kafkesque.” When I saw that someone had referred to my blog as “Kafkaesque — Thomas Hardy once wrote…. etc.”, it seemed time for a definite change. LOL. As for O/J samples, have you considered Surrender to Chance for the main, regular line? There is a 3-perfume sampler set for $10.99: http://surrendertochance.com/ormonde-jayne-pick-3-1-2-ml-sampler-pack/ US shipping is a flat-rate $2.95. OOHH!! Thanks for letting me know! I can surely do $10.99 and a reasonable shipping fee! I love vintage as this is what I grew up with so I am sure to like this line! I will be stopping by on a regular basis now that I have subscribed…. I don’t know which one gives me greater pleasure — the thought of you stopping by more often or the thought of you getting perfume samples. Honestly? It’s the perfume samples! I get a wicked joy out of leading people down the path of temptation…. (No, really, I do!) To me, it doesn’t matter if you try Ormonde Jayne (though I definitely think you should) or something else; I just want you to have the chance to sniff some good stuff. Life is too short to rely on Sephora and it’s even worse when that one avenue is 45 minutes away! Egads, you poor, poor thing. I don’t know your perfume profile at all, so I don’t know what to suggest but this is what I would do: 1st, sign up for the Surrender to Chance newsletter that gives you the monthly discount codes. Second, explore to your heart’s content. They have a vintage section too! Also, if you go to the Beginner’s Guide to Perfume linked at the very top of each page, you should find in the comments my links to various sample sets at Surrender to Chance. Surrender to Chance can be a bit tricky to navigate at first when it comes to their many, many, MANY samplers, so what I’d suggest doing is just giving a look at the 4 and 5 star lists of perfumes based on Luca Turin’s Guidelines. Now, with your very first order, you should receive 10% off. If that first-timer thing no longer exists, then this is the code for March that will let you get 5% off your order, no matter how small (separate code for orders over $75): “5% off with code nomoresnow.” So, the code is: nomoresnow. here is my profile (since you brought it up :)!!). Started wearing mum’s perfume at 5 (mid 1970s before re-formulations) and demanded my own collection at 6. Wore all the classics (Chanel, Guerlain, Dior,etc) in my pre-teens and teens. Lived in NYC my whole life (one of the best places for perfume access) until 30. Once I moved I lost touch with all that was current (ie:niche) until I discovered the land of perfume blogging in 2008. But I have worn over 400 different fragrances over the course of 40 some odd years! I will definitely check out the OJ line and have you to thank if I feel the need to succumb to that $125 bottle (keep in mind I am funding perfume for four in this house as my three children have been afflicted with my obsession-LOL!). Brie, I just wanted to mention that a) it doesn’t matter where you live in the US: I don’t know a single place anywhere that carries OJ line; b) I still think that the beautiful official discovery set of 12 x 2 ml spray samples for $75 including delivery is much better than 3 x 0.5 ml dab samples for ~$14. And since they are rare in the U.S. if you try and do not want to keep them you should be able to recover at least partial value selling them on eBay. Ok Undina! You have talked me into it 🙂 !! Will go for that discovery set..perhaps next month for my birthday! I left a comment and then it disappeared! I will try again but if it posts twice, my apologies! I have never tried an OJ but have heard wonderful things about this line! My fear is that I might fall in love and I don’t exactly have $422 to burn! And what happened to your Thomas Hardy quote? He was my absolute favorite author as a young adult. It showed up, never fear. 🙂 Since this was the first time you were posting here, the Spam filter required initial admin approval. Thereafter, everything you write will just post automatically. BTW, I’m so glad you liked the Monet. 🙂 One of his much lesser-known works but so beautiful in its quiet delicacy and mood. My all time favorite museum is the Musee D”Orsay in Paris…there one can get her fill of Monet 🙂 !! I loved the Musée D’Orsay as well, so much more doable than The Louvre. This was 11 years ago so things probably changed quite a bit since then. The other museum I made sure not to miss was Musée de l’Orangerie – there’s the Water Lilies room in the lower level (if I recall correctly) that literally just envelopes you the beauty and wonder of Monet’s genius. I’m torn on this. Like you, I expected certain things with Tsarina and it seems the reality won’t meet the lofty expectations. But, on its own, this really does sound lovely. When you mentioned cutting into a lemon and the juices squirting, that’s how I felt about Azemour (but with an orange) and why it was so disappointing when you had the dust bowl experience! I agree with all of that. If the perfume did not come with the heavy associations of Tsarina and if it were, say, a Chanel Exclusif, Guerlain or Caron, then it would be an absolutely lovely iris scent. In fact, I think this is a lot better than some of the modern Chanels and Guerlains! A lot. But it doesn’t speak “Tsarina” to me at all. Nor do I get sinuous black panthers or the rest of the things that the Candy Perfume Boy wrote about. To me, it was a lovely, delicate Monet painting and cool, blonde Grace Kelly in her grey-white suede-looking coat with suede gloves. The very reason why I tested the perfume THREE times was because of just how unexpected the vision and feel of the perfume was. As you know, I don’t particularly like iris scents, but this one really grew on me and the middle stage definitely became alluring by the 2nd test. Alas, it’s simply not my personal style and its sheerness didn’t help either. You know I like my personal fragrances to be extremely rich and heavy. LOL. So, I finally tried this one. Hideously boring, IMO. Not only boring, but absolutely fleeting to an alarming degree. I spilled a sizable portion of the decant on my arm (probably about 3-4 wears worth) and I could barely smell anything. What I could smell was nice enough (I guess), but utterly forgettable and the whole thing was gone in about an hour. Or, at least, if not gone, barely perceptible. What a disappointment, and totally unworthy of the name! LOL. “Hideously boring” is perhaps the most damning indictment one can give a fragrance. I wish this had worked for you, especially given the associations and name. What’s interesting is that you actually like iris scents, while it’s really not my personal thing at all. But if something is that fleeting (with a large quantity), then it really is the final nail in the coffin, especially at the price. The combination of notes sounds like this perfume would smell good to me. Iris, soft suede and all. Too bad I can’t try it now. But you will in a few months when you go to London! 🙂 This is definitely a scent you would adore, Lucas! When you say I’m gonna adore it – I believe you – there were few times when your “you’ll like it” comments turned out not to be true. My trip to London is a big question mark I’m afraid. Still haven’t heard from a fried that offered me to stay at her place. She went to the USA in early January and she was supposed to be back in February but she’s not returned yet it seems as she doesn’t reply to facebook and email. Oh…. 🙁 I’m so sorry. I hope she replies soon and that the offer is still open. That would be a shame to miss out on a fun trip and to get away for a little break, even apart from the perfume issue. Fingers crossed that it works out in the end. If it won’t work in May (we’re having some national days and there’ll be an ENTIRE free week, no uni and I wanted to use this opportunity) but if she doesn’t reply in proper time for booking the tickets it might eventually work in the summer. PS- I’m so glad so many of you are Monet fans! Now I don’t have to hold back quite so much in posting his paintings. I will be definitely ordering the samples from StC, quite intrigued with Ormond Woman. Thank you for recommending it, Kafka! P.S. Why would they put gender on the perfumes? Wouldn`t it be much more fun to discover yourself which ones you like it without stupid marketing strategies? what a knockput of a review! Thank you! That was great to read! Nice review, dear Kafka! Too bad about the decant services not having them yet. BUT, I will be in London for a few days in August so I will make sure to stop by one of the boutiques – the thought of Harrods is giving me the willies. Tolu has my no-no note so I am circling around it. I have the Discovery Set that is sadly being neglected right now. Re. Tolu: are we really so sure that Muguet/Lily of the Valley is your no-no note? Undina seems less than convinced that that was the responsible culprit in the Andy Tauer scent. But, believe me, I fully understand leeriness and circling around perfumes with notes that one struggles with. Scent mule! I may go over my luggage and alcohol limit. I have to be really smart about packing. The next time I go to Saks, I will go sniff out some – shudder – LOTV/muguet. Your Royal allusions are illuminating in the extreme and the perfume you have described does indeed sound a great deal more like the tragic Princess Grace than the Great Catherine. I would go further in fact and say that the notes iris and suede are somehow linked in my head with the once humble Miss Kelly – I wonder why that can be? Perhaps because I synesthetically associate them with the pale greys and pastels that comprised so much Monegasque monarch’s consort’s wardrobe. 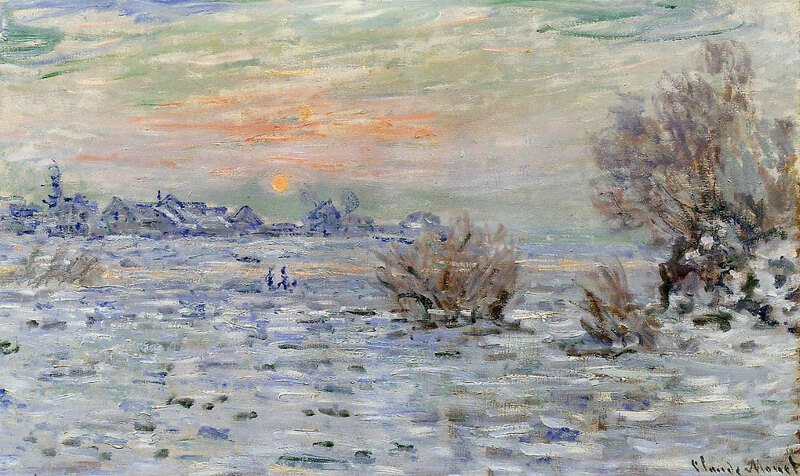 Perhaps I am not so much out of step with yourself for are not the impressionists’ winter paintings like the season somewhat etiolated and drained of colour? I can therefore see why you might be left longing for the Garden at Giverny when all you are offered is Pissarro’s snowy streets. If this is still being sold in the stores I may well call by – they are a jolly friendly lot – and give it a go, I seem to be embroiled with a lot of irises at the moment. Ooops. I forgot to mention that there is of course a Tsarine champagne – it’s swirling class bottle and bright colours though would belie this perfume I feel. Yes, definitely something etiolated and drained in favour of the pale colours so favoured by the late Princess. I tried to find photos of her wearing something suede and it almost looks as though her coat in one of the pictures might be grey suede, but I suspect it’s more likely to be cashmere. Still, the perfume definitely doesn’t feel like the Mighty Catherine. If the labdanum had been a constant backbone and very heavy, dirty and leathery in feel, I might have seen something more akin to rich brocades and leathers. Alas, not on my skin — not in any of 3 different tests. Yes, I can see you as a Klimt. I’m not sure what I should be… a matter for some personal perfumed soul searching I feel. In the meantime I will be sure to search out this iris. I don’t know if to thank you for the review 😉 So far it sounds exactly how I expected it to be – and I want it. When I read about the new line I thought that I wanted to try all four but the biggest expectations were for Tsarina. But, of course, I’ll be curious to read your impressions for all of them. If your wallet hates me, but you find a scent that you adore, then I will happily take the split in reactions. 🙂 Besides, I feel it’s my duty to lead you all into temptation. LOL! For what it’s worth, my wallet hates me too. This is one very expensive passion we have. Unfortunately (for my wallet 🙂 )delivery of perfumes from the U.K. isn’t a problem for me. Oh, well… If it’s meant to be, sooner or later we’ll meet each other. But I’m not blind buying any perfumes any more! Oh dear. Your poor wallet! So, let’s hope the US decant sites get Tsarina sometime soon so that you can test it out for yourself. That way, your wallet will only have to suffer a non-blind purchase…. LOL. Hmm, I very much like the sound of your description, while that of the CPB scares me slightly, much as I like Parfum Initial on its current budget! I will just have to try this I expect to know how wispy, suede-y dove grey glove-like it is versus something altogether more raunchy! CPB? I’m sorry, I must be overly tired still as I’m drawing a total blank. I keep reading CPB as Camilla Parker Bowles. LOL. I like Brie have never had the privilege of trying any of the line 🙁 I think that like any easily distracted girl, I have it on my radar, but then some pretty pink Serge Lutens thing wafts my way and down a different rabbit hole I go! They got me before I could see the bottle. Macy’s no longer carries the old one. I took one for the team!!!! I really hope you try some samples of OJ, especially if you like Geza Schoen who has recently been revealed to have assisted with all her prior fragrances too. They’re definitely something a serious perfumista should give a sniff to because of how luxurious and rich the ingredients. Oh wow! I am seriously close to the first blind buy of my life! Watch, I will succumb . . . probably sooner than later! Just Cavalli is . . . unmemorable. I don’t remember anything about it other than thinking that if I happened to pass a sink, I would wash it off — which probably means that it didn’t even inspire the passionate need to scrub. It’s September 2013. I just saw a samples at Surrender to Chance albeit expensive since they’re so limited.